An Irish man has driven an electric car 9,500km from Galway to Morocco – and back. In a drive that will forever banish fears of range anxiety in electric vehicles, Grattan Healy and his partner, Simona, travelled to Ouarzazate in Morocco (via Edinburgh) in his Tesla Model S.
Now he and Simona are thinking about driving the Tesla to eastern Iran for their next major trip. Grattan outside the Berbere Palace Hotel in Ouarzazate. Grattan is an energy specialist. He was adviser to the Green Party in the European Parliament for six years up to the end of 2001. Deeply involved in the whole area of renewable energy, he says he “lives between Inverin and Ballsbridge”, but likes to get away to warmer climes for part of the winter. Hence the trip to Morocco. As you may know, Tesla recently set up an Irish store at Sandyford, Dublin, but Grattan already had a Model S and had driven it extensively around the country. He said the “ease of living” with the car led him to consider what might be possible. They had previously driven as far as Marrakech in a petrol Audi Allroad. “After that trip, we were keen to go further and get across the High Atlas to the next large town of Ouarzazate, 200km further on to explore the ‘other Morocco,” he said. They planned the trip and route thoroughly, but left enough loose ends to have “some adventure”. “Considering you can charge at almost any power source, and there are probably more electrical sockets in Morocco than petrol stations, we just needed to make sure we had the right equipment to be able to charge,” Grattan explained. “I only require a Type2 cable to charge my car in Ireland, though we also carry a Tesla adaptor for the faster CHAdeMO chargers. The couple travelled to Belfast, onto Edinburgh to visit family, down through the UK, onto the Chunnel, through central France and then hitting the east coast of Spain (thanks to the growing network of Tesla superchargers). They also used Tesla Destination Chargers at hotels along the way. Their route then took them through Tangier and onto Casablanca. They arrived at Marrakech with more than half-a-tank left. A few days later, they headed for the High Atlas mountains. “That first half of the journey used 40pc of our battery, so we were at least confident of reaching Ouarzazate,” Grattan said. He reports that the hotel staff were surprised to learn they had crossed the High Atlas in an electric vehicle. “The reception manager claimed ours was the first electric vehicle in Ouarzazate,” he added. 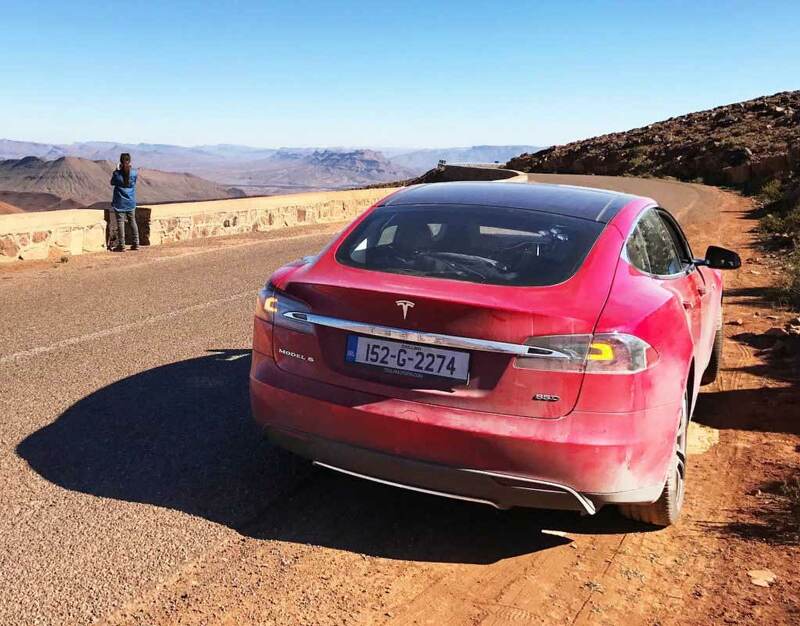 The hotel’s technicians, within an hour, had come up with a temporary Schuko socket with which to charge the Model S.”That enabled us to explore the wonderful Dades and Draa valleys over the following two days,” Grattan said. They celebrated New Year at the hotel before heading back across the Atlas to Marrakech. Then they followed the same route to Spain. In total, they covered 9,500km and at “minimal cost”. Range anxiety? Never again. This entry was posted in blog and tagged tesla ouarzazate.